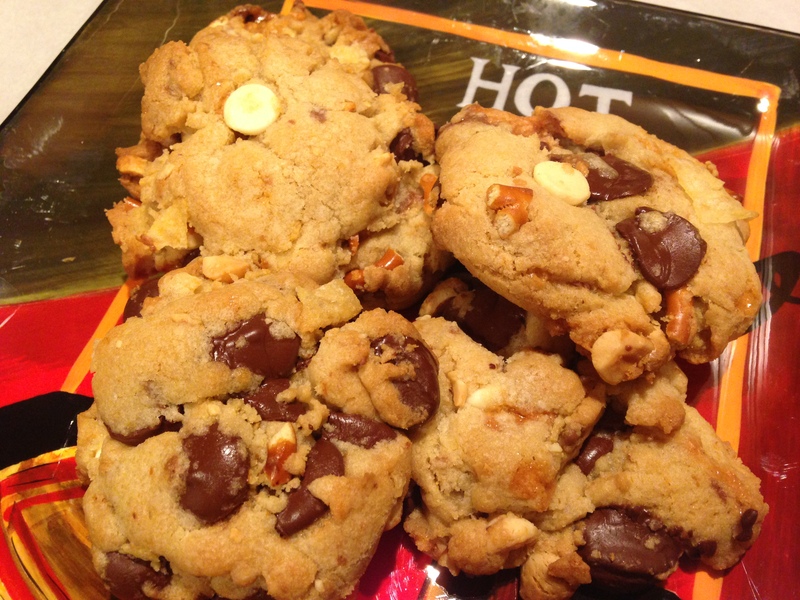 I want to bake different cookies and sweets each week. I always make the family favorites and would like to add some new ones to that list. I found this recipe here. I ended up changing a couple of the ingredients to our taste. The sweet and savory flavors really work together. Too Simple and of course Delicious! 2. Using stand up mixer fitted with paddle attachment beat butter at medium speed until soft and smooth. Add the brown sugar, sugar and salt, then beat at medium high speed. Scrape down the side of the bowl with a rubber spatula as needed until light and fluffy. 3. Add the eggs and vanilla, beat until just combined. Add the flour and baking soda, beat at low speed until just combined. Scrape down side of bowl as needed. 4. Add the rest of the ingredients. Mix until blended. 6. After chilled, remove from fridge. 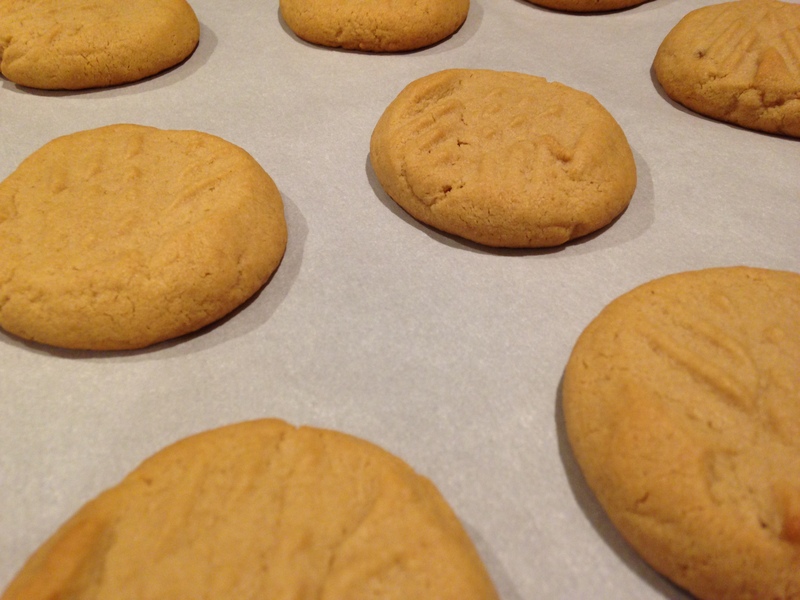 Place cookies on parchment lined cookie sheet, 2 inches apart. Flatten the cookies down a bit with the palm of your hand. If desired, sprinkle with the sea salt (I bet you could use Kosher too). I did not do this step and they were still awesome! 7. Bake for 12 minutes. I bake for 6 minutes, than rotate the cookie sheet. They bake even that way. That’s it. Takes no time at all. Enjoy!! Martin2 sent me this pic and asked if I could make a better rendition than the one in the box. I love it when I am given a baking challenge. It took me awhile to decide how I was going to replicate this. 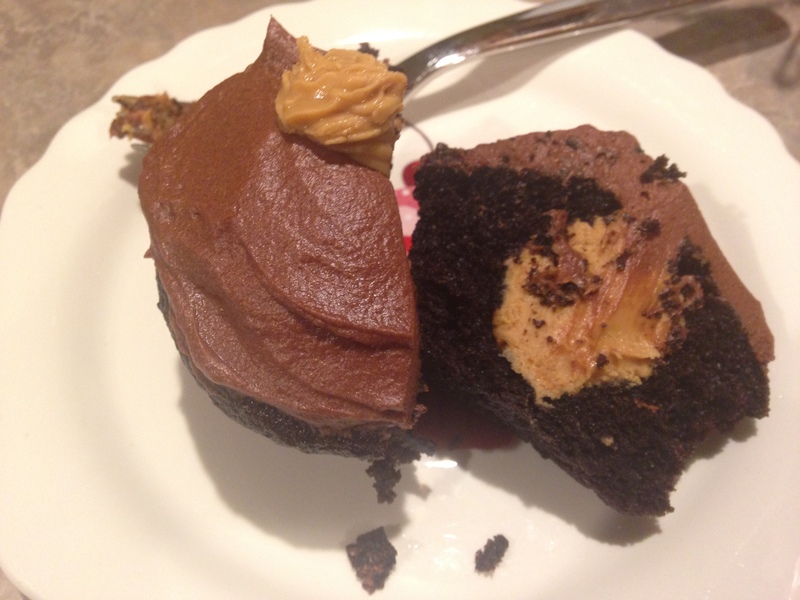 I went online and found some recipes but decided to use the Hershey’s Cocoa Chocolate Cake recipe, America’s Test Kitchen Chocolate Ganache and America’s Test Kitchen Chocolate Buttercream frosting and the basic peanut butter filling recipe. 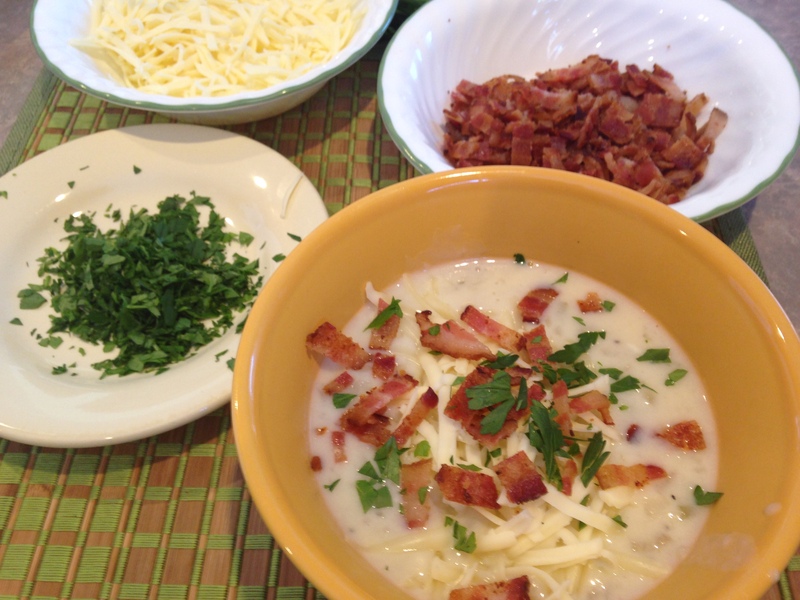 This is a simple and delicious recipe but takes time. 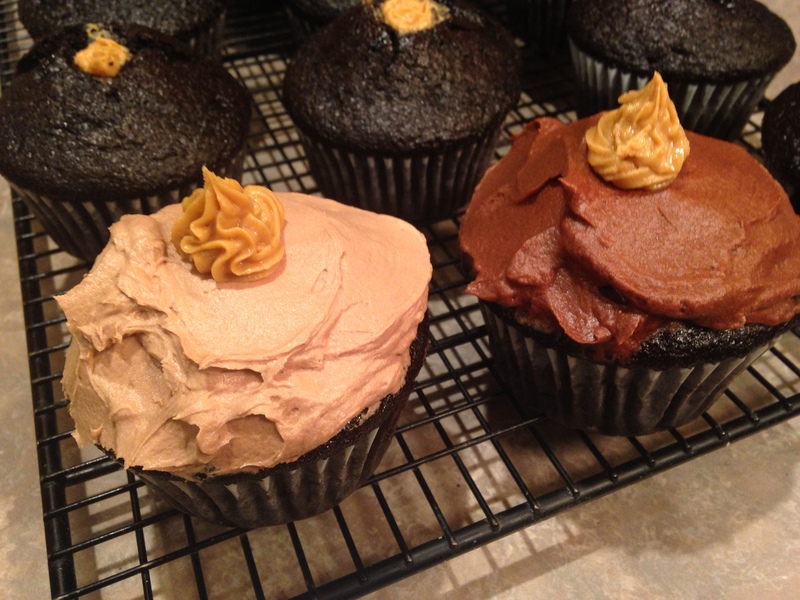 If you have a couple of hours, you can bake these awesome cupcakes! 1. Preheat oven to 350 degrees. If you are going to bake a cake, grease and flour the baking dish you will be using. Since I did cupcakes, I used paper cupcake liners. 3. Add the eggs, milk, oil and vanilla extract. Mix on medium speed for 2 minutes. 4. Add boiling water. The batter will be thin. 5. Fill cupcake liners 2/3 full. Tap lightly on counter to lift the air bubbles. 6. Bake 20 minutes. Remove from oven and cool on wire rack. After cupcakes have cooled. Put peanut butter filling in pastry bag with a star tip. Insert tip 3/4 inch into top of cupcake. As you press pull up. 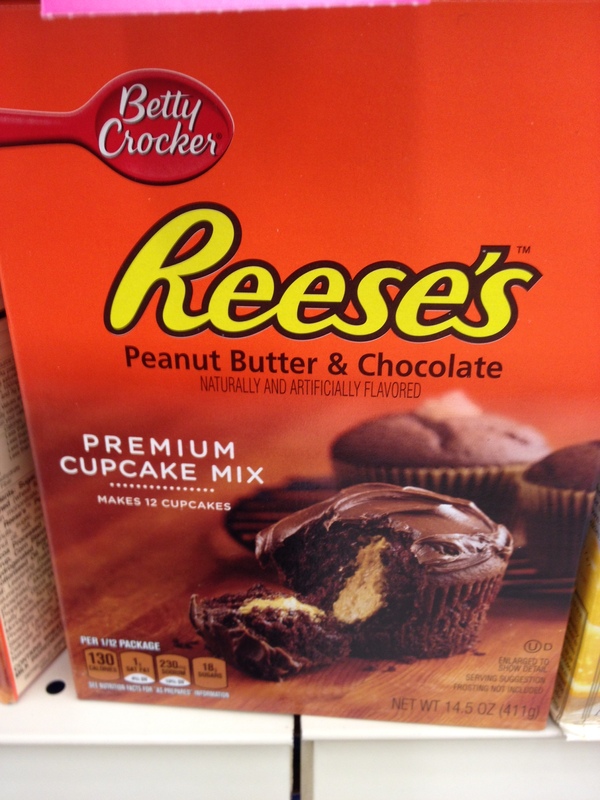 You should put about a tablespoon of filling in the cupcake. I gauged it by filling a tablespoon with filling before I started. As I filled the cupcake you can feel it and the top will crack. After I filled with peanut butter filling I frosted the cupcake and topped with a rosette. 1. 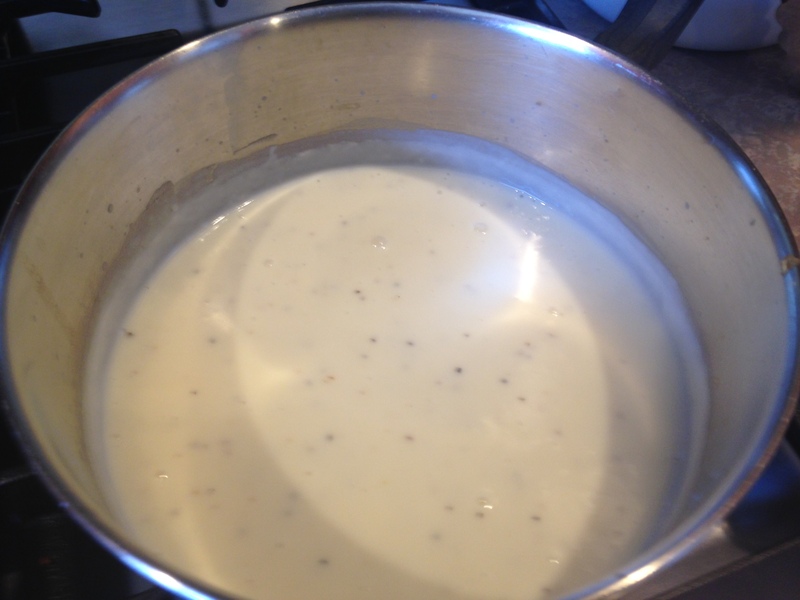 Bring cream to boil in small saucepan or in microwave. Place chocolate in medium bowl and pour boiling cream over. Cover with foil and let stand 5 minutes. Whisk until smooth, then cover with plastic wrap and refrigerate until cool and slightly firm, 45 minutes to 1 hour. 2. Transfer cooled chocolate mixture to bowl of standing mixer fitted with whisk attachment; whip mixture at medium speed until fluffy and mousse-like and forms medium-stiff peaks, about 2 minutes. This is a very fluffy, airy frosting. It is also very rich. I LOVE it. Keep it refrigerated. In standing mixer fitted with whisk attachment, beat butter at medium-high speed until smooth, about 20 seconds. Add confectioners’ sugar and salt; beat at medium-low speed until most of the sugar is moistened, about 45 seconds. Scrape down bowl and beat at medium speed until mixture is fully combined, about 15 seconds; scrape bowl, add vanilla and beat at medium speed until incorporated, about 10 seconds, then reduce speed to low and gradually beat in melted chocolate. Increase speed to medium-high and beat until light and fluffy, about 4 minutes, scraping down bowl once or twice. As I mentioned this is a time consuming treat. It is well worth it though. Enjoy!! 1. 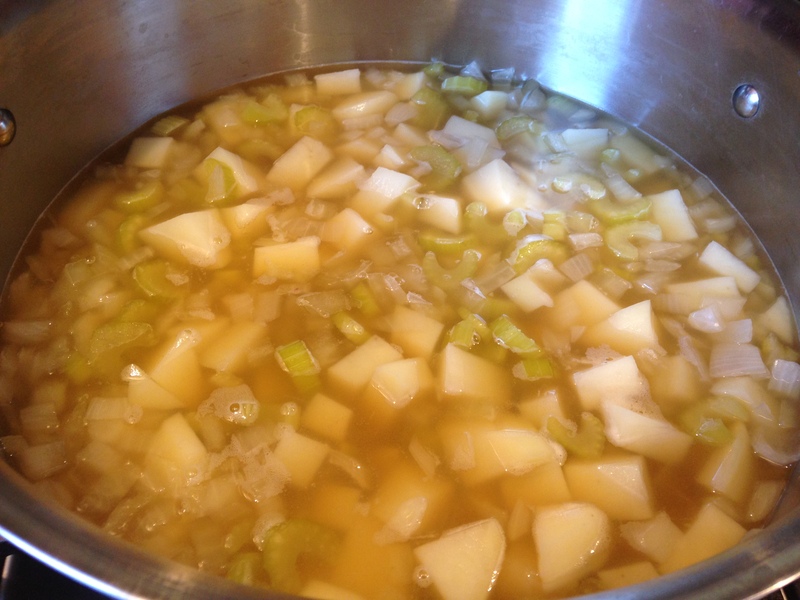 In a saucepan, combine chicken broth, celery and onions over medium high heat to a boil. 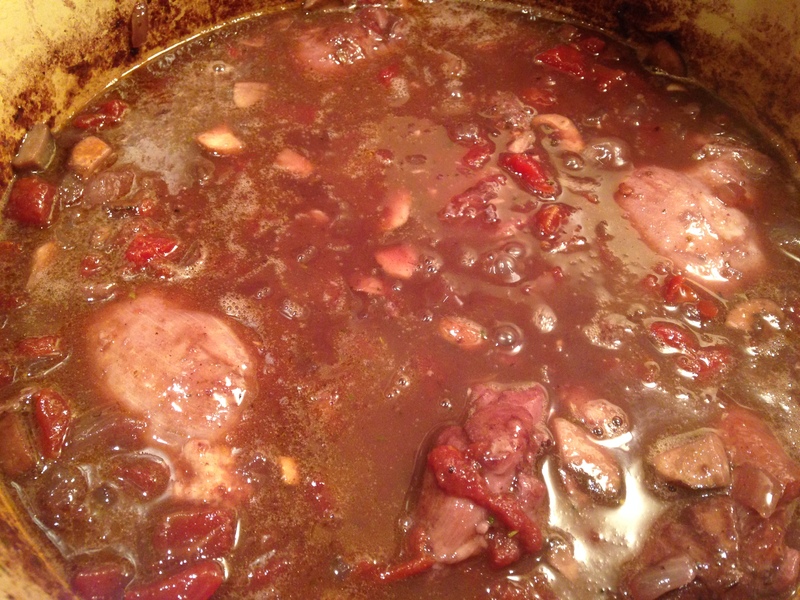 Turn down to medium to low and simmer for 30 minutes or until tender. 2. 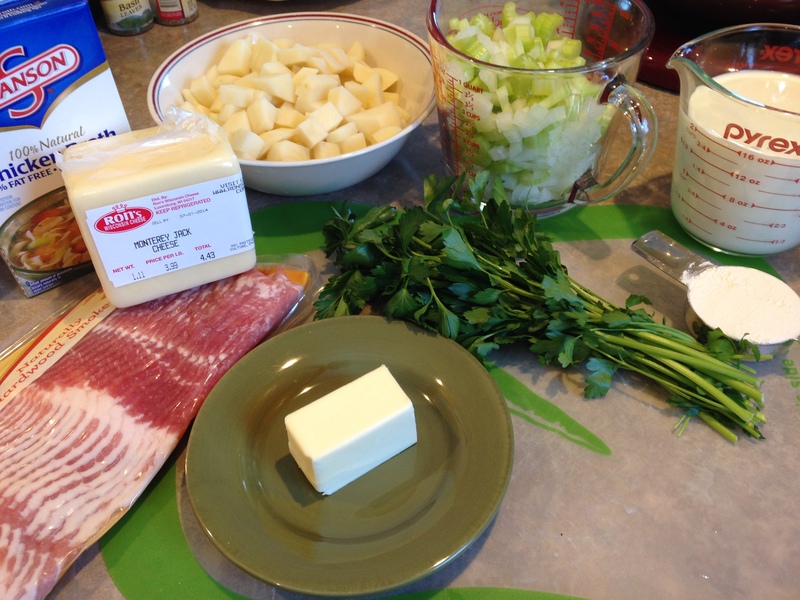 Add cubed potatoes, cook 15 minutes or until potatoes are soft. When they are completely done, mash about half of the potatoes with a potato masher right in the pan. 3. In another sauce pan, while the potatoes are cooking, melt 4 Tablespoons of butter. Mix together the flour, salt and pepper. Add to the melted butter and stir until well mixed. 4. Slowly add the milk and whisk until it thickens and bubbles. 5. 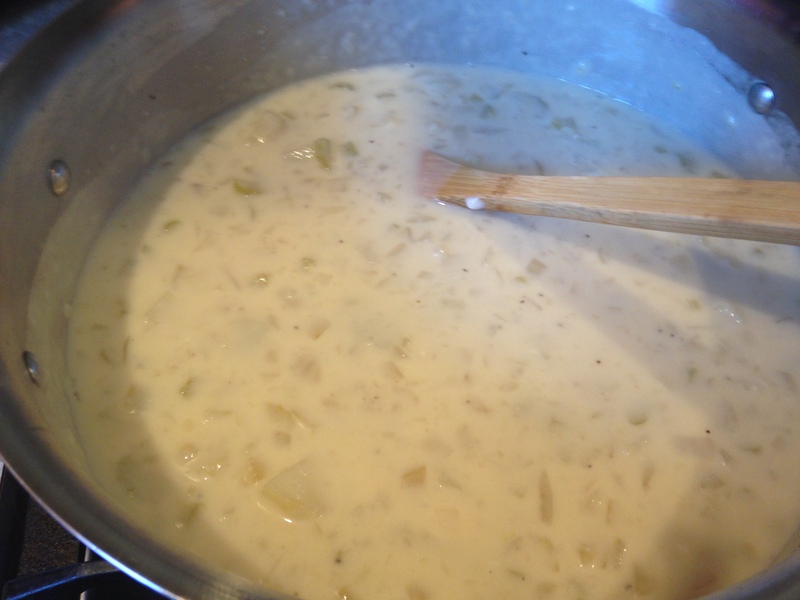 Add the milk mixture to the potato soup. 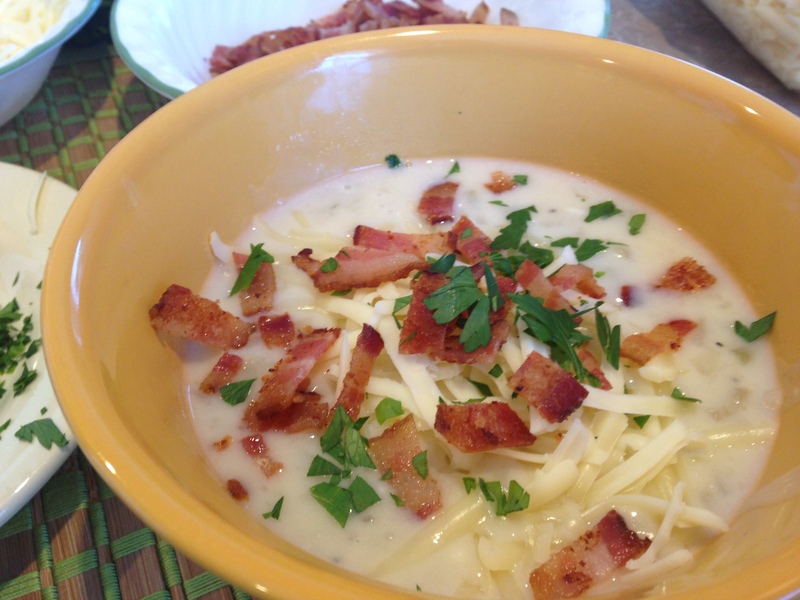 You can have this soup with or without the extras. It tastes delicious either way. Enjoy! I am finding more and more that I really like to come home after work and make a quick dinner. I pulled some chicken out of the freezer yesterday so I knew I had to use that today. I had a couple of tomatoes and shallots that needed to be used up. I made this very quick skillet dinner and served over rice. It was quite spicy (which Kent and I love) and speedy (which works for me too!). 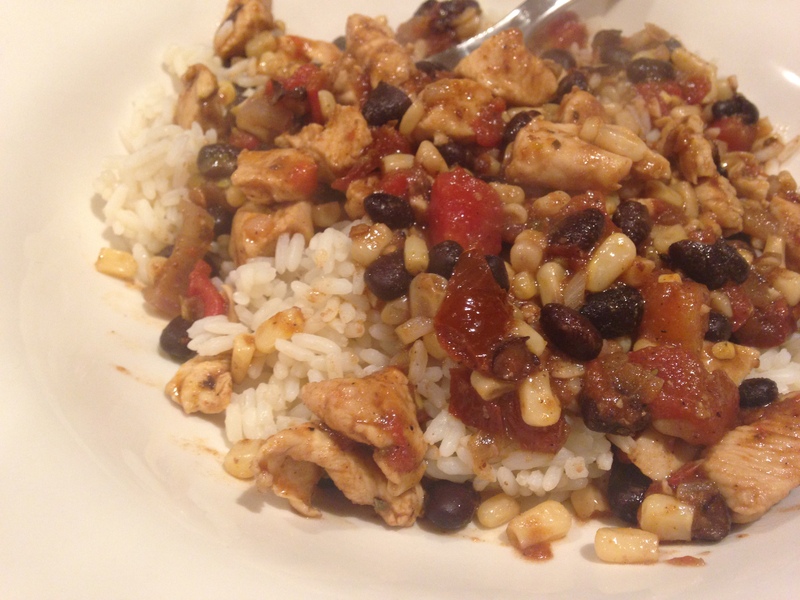 So, as I always end my intro; try this “Simple and Delicious” meal! 1. Place 2 Tablespoons of canola oil in non stick skillet over medium heat. 2. Add shallots and diced tomatoes (If you do not have the tomatoes, just the shallots. 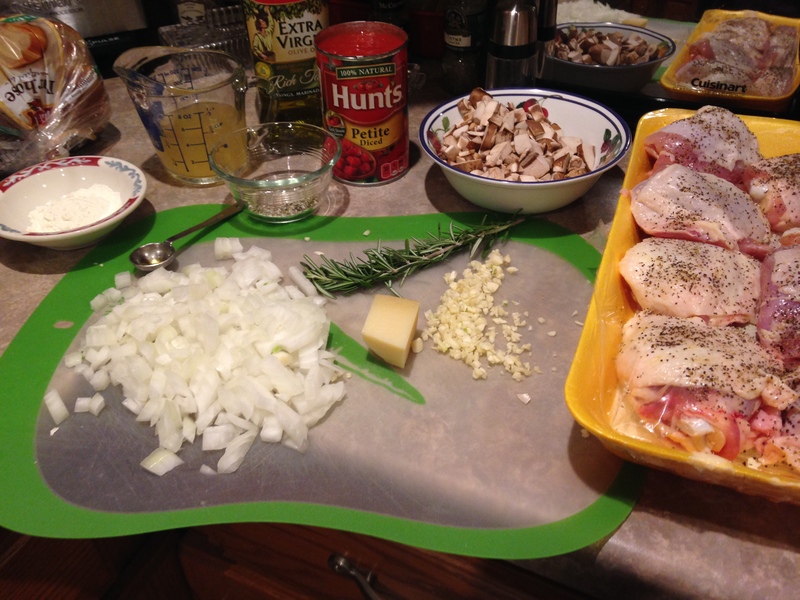 ), saute until opaque – about 3-4 minutes. 3. Add chicken, cook over medium high until browned, 5-8 minutes. 4. Add cumin, chili powder, salt, pepper, garlic and chipotle peppers, stir into mixture until fragrant (30-60 seconds). 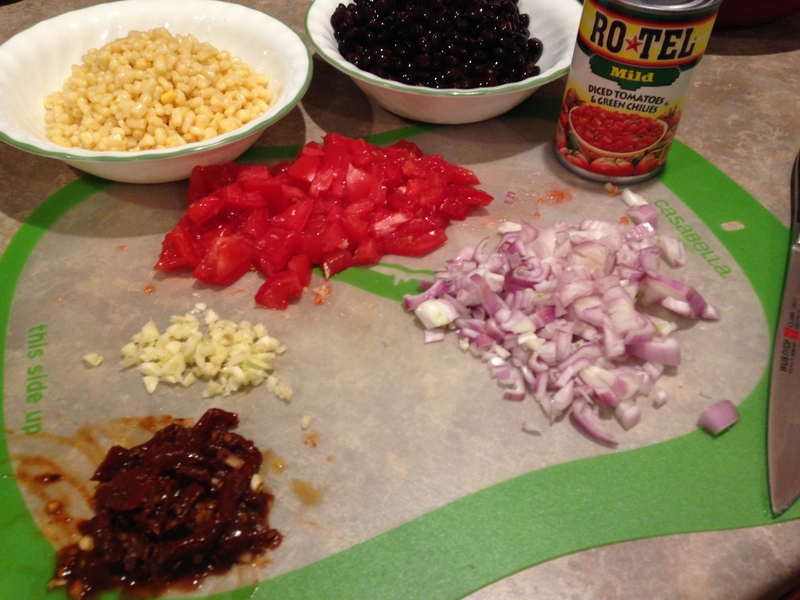 Add rest of ingredients; black beans, corn and Rotel tomatoes/green chilies. 5. Simmer uncovered for 20-30 minutes. I used long grain rice. When I cook rice I use 2 cups of liquid (water, broth, stock) to 1 cup of rice. Kent and I really enjoyed this simple and delicious meal. I had fun thinking what I had in my kitchen to use vs running to the store to buy ingredients for a recipe I found online. It is too cold to go to the store!! Where is Spring?! 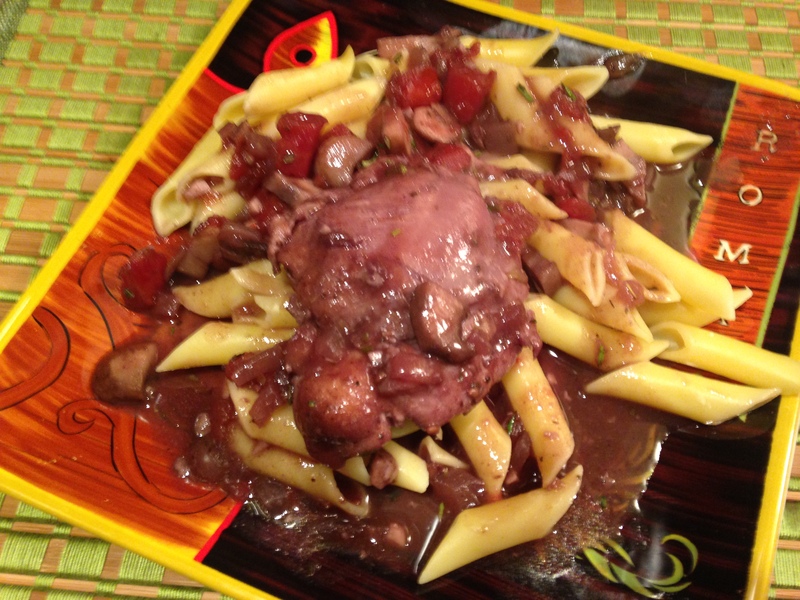 Enjoy this Simple and Delicious meal!! Every Sunday I make dinner for whoever wants to come over. 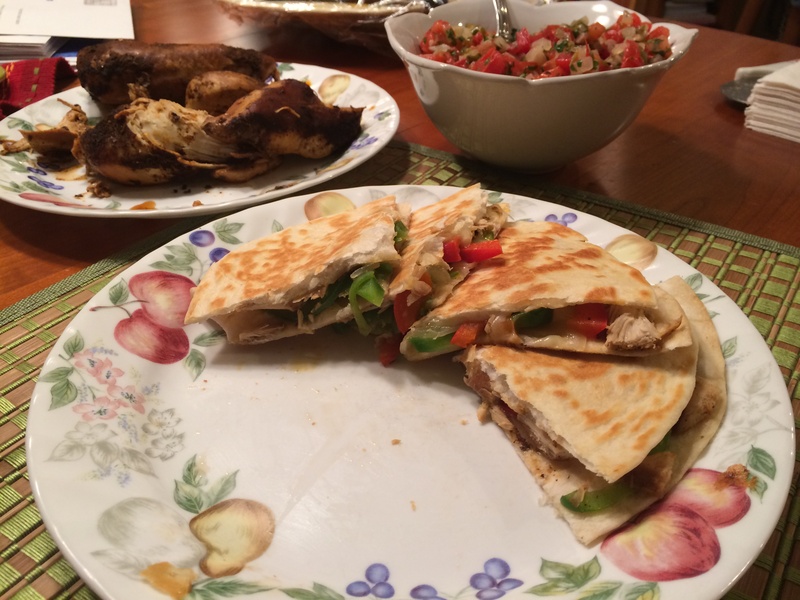 Last Sunday Eric suggested Chicken Quesadillas. This was a recipe Eric found on Food Network. These were way too easy. Definitely a weekday meal you can make under 45 minutes. Honestly, nothing takes me less than 45 minutes. 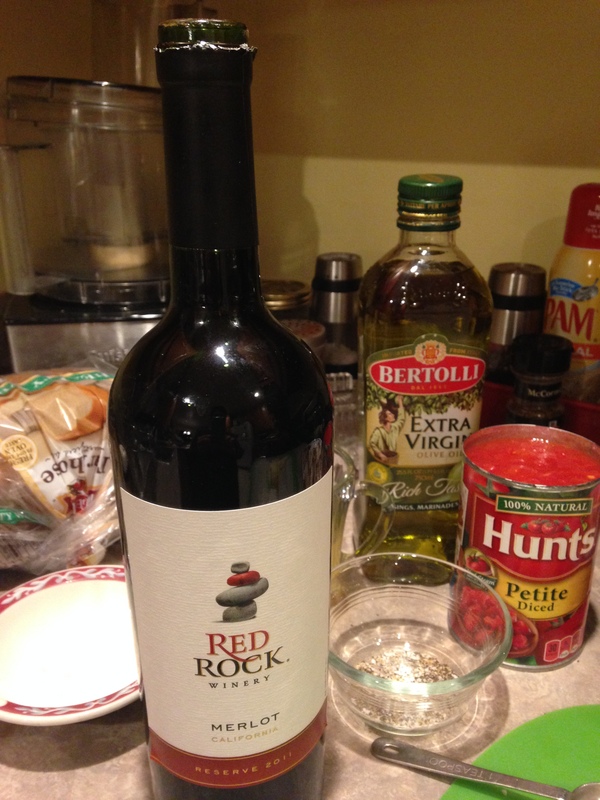 Even if I make a Rachel Ray 30 minute meal – NOPE. 45 minutes for this chickie!! This meal is very simple and delicious. Give it a try!! 1. I prepared the chicken in the crock pot. I sliced the chicken into strips. If you do it per the Food Network recipe you should heat 1 Tablespoon of oil in a skillet over high heat. Sprinkle the chicken with salt, pepper and taco seasoning. Add the chicken to the skillet and saute over medium high heat until done, about 4 minutes per side. Remove from the skillet and dice into cubes. Set aside. 2. Add the remaining oil to the skillet over high heat. Saute the onions and peppers until softened. About 4-6 minutes. 3. Sizzle 1/2 Tablespoon of the butter in a non stick skillet. Over medium heat lay a flour tortilla in the skillet. 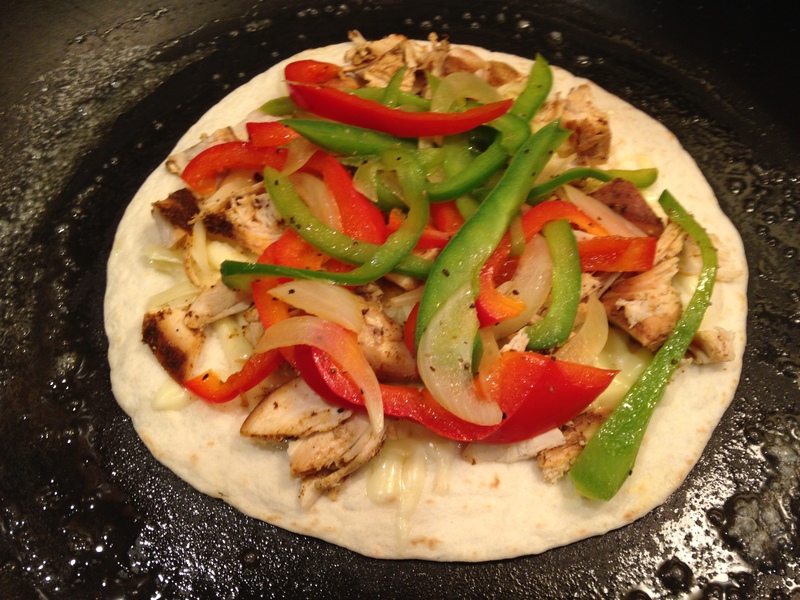 Build the quesadilla by laying the cheese on the bottom of the tortilla, top with chicken, cooked peppers and end with more grated cheese, top with a second tortilla. 5. Cut each quesadilla into wedges and serve with Pico de Gallo. 1. Dice up the tomatoes, chop the onions and the cilantro (parsley). 2. Slice the jalapeno in half. With a spoon scrape out the seeds. If you like things spicy, leave in some of the white membranes. Dice the jalapenos very finely. Place in bowl with tomatoes, onions and cilantro (parsley). 3. Slice the lime in half and squeeze the juice into the bowl. Sprinkle with salt, and stir together until combined. Hope you like it as much as we did!! These cookies are a favorite in our home. The Martin’s really love them! I got this recipe from Epicurious many years ago. December 29, 2007 to be exact! As always they are simple and delicious! 1. Preheat oven to 350 degrees. 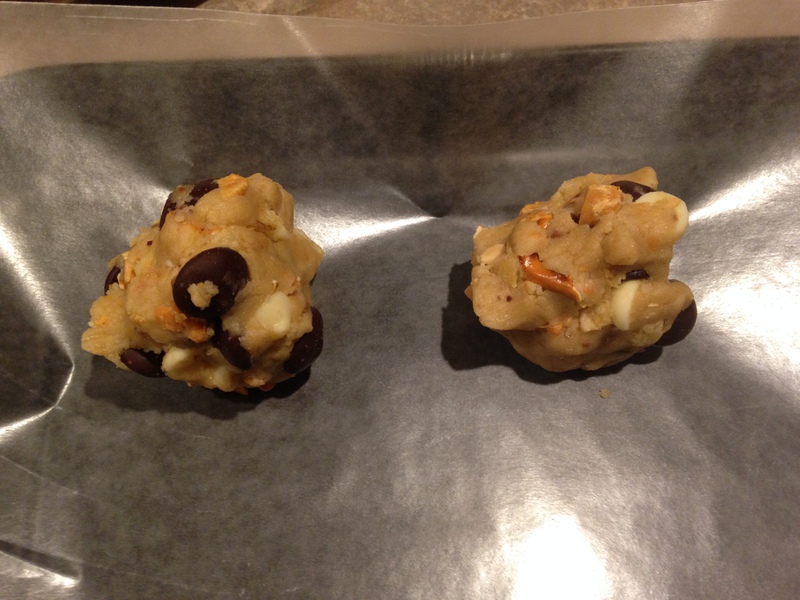 Line 2 baking sheets with parchment paper. 2. Cream peanut butter, butter and vanilla in a large bowl. (I use my stand up mixer. You can use an electric mixer or by hand.) Beat in both sugars. 3. Stir in 1/2 dry ingredients. Add eggs 1 at a time, mixing well after each addition. 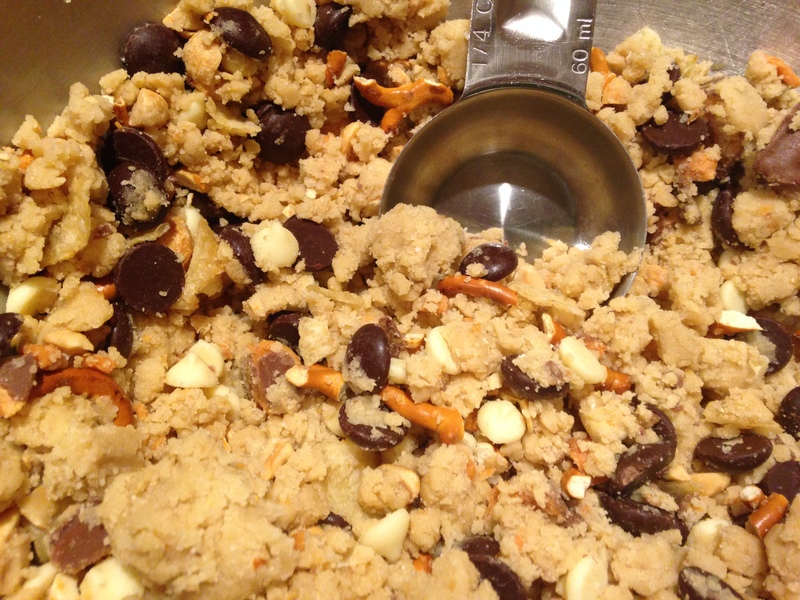 Mix in remaining dry ingredients. 4. For each cookie roll into a ball about 1 3/4 inch in diameter. Using back of fork, flatten dough balls and form a crosshatch design on the tops. 6. Cool cookies on baking sheet. 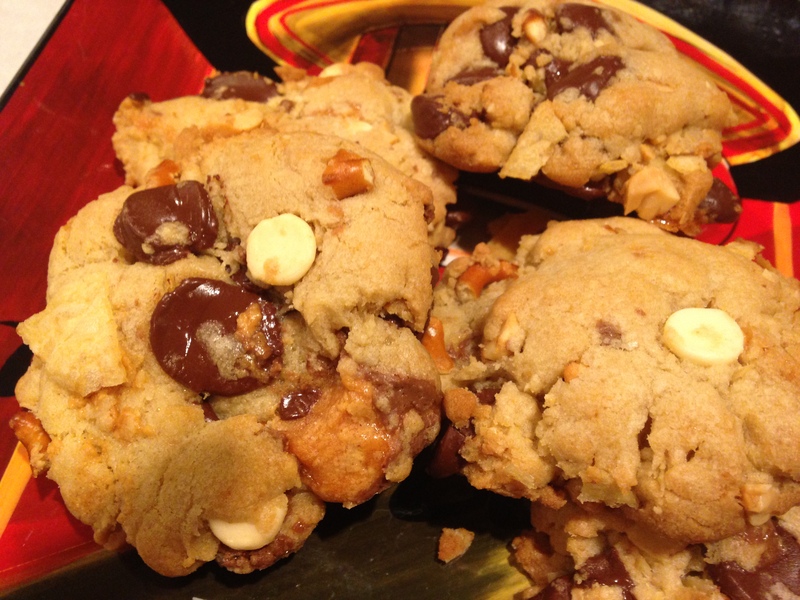 These are a great cookie right out of the oven! !